Chocolate for breakfast might seem a little indulgent, but these fun flapjacks are a delightful treat for special breakfasts and brunches, especially for dairy-free kids. Serve them with maple syrup, powdered sugar or even a little extra melted chocolate. In a large mixing bowl, sift together the flour, sugar, baking powder, and salt until well combined. Set aside. In another mixing bowl, whisk together the eggs, vanilla soy milk, and canola oil until well-mixed. Add the wet ingredients to the dry ingredients, mixing until combined. Fold in the dairy-free chocolate chips. Lightly grease a large skillet or griddle and heat over medium-high heat. Add batter to the pan 1/4 cup for each pancake. 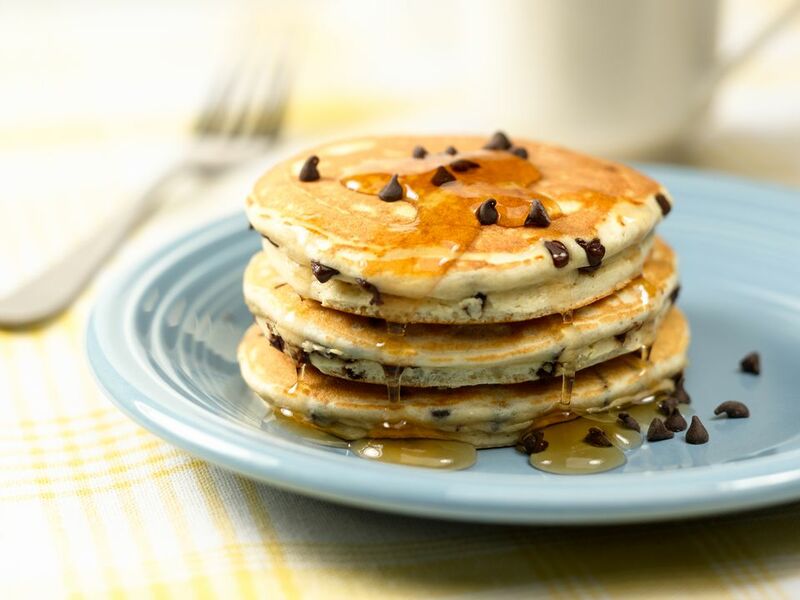 Cook until bubbles appear on the surface of the pancakes, then flip, and cook until both sides are golden brown. Transfer to a serving plate and serve immediately with warm maple syrup, powdered sugar, or more melted dairy-free chocolate.